Modification of Bituminous products requires addition of an ingredient which changes the rheological properties specially elasticity, resistance to wear deformities etc. In India, most of the aggregates used for Road Construction bears a negative charge, using a negatively charged modification material like Anionic latex that leads to the formation of improper bonding under the stress of repulsive forces. â��CATLAXâ�� is the Cationic Latex of Natural Rubber introduced by Petrochem Specialities, which gives an excellent bonding and compatibility with Bitumen and different aggregates. Specially made under controlled process, our Cationic Latex provides a better alternative to imported Latex of Synthetic Rubber eg. SBR. â��CATLAXâ�� saves time and money. 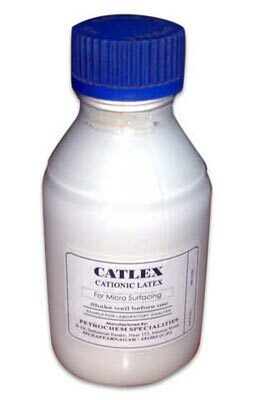 We make Cationic Latex available at competitive prices. In addition, we are a noteworthy Manufacturer & Exporter of Cationic Latex. â��CATLAXâ�� is a fine suspension of positively charged particles of Natural Rubber in water under the balancing force of stabilizing agents. The pH is slight acidic within the range of 5.5 to 6.5. The solid rubber obtained from â��CATLAXâ�� shows the same physical properties, as that of obtained from natural latex, however there is slight variation in affinity profile. â��CATLAXâ�� is primarily compatible with most of the Bitumen Grades and Cationic Bitumen Emulsions. However a preliminary compatibility testing needs to be done before using this product in bulk. The product is readily miscible with common grades of Cationic Bitumen Emulsions and modifies their performance profile (â��CATLAXâ�� can be added to Cationic Bitumen Emulsion just before milling in colloid mill or at the time of use), also it can be added to molten bitumen, however precautions must be observed as latex contains good amount of water. After addition, modified Bitumen Emulsion or modified bitumen can be used as usual. As â��CATLAXâ�� is readily dispersible with most of Cationic Bitumen Emulsions, It can be added to Emulsion drums by simple pouring into barrel and after fixing the lid tightly, rolling the drum for 10 minutes. It can be added to bulk storage tanks fitted with mechanical stirrers ensuring proper distribution on the Latex. The most convenient method is to mix it with soap phase and then mill with Bitumen in colloid mill to get ready Modified Bitumen Emulsion. For Modified Bitumen, it can be added directly to molten bitumen and then stirring well. Being cationic â��CATLAXâ�� is corrosive in nature hence care must be observed to avoid storage in metallic vassal. Care should be taken while handling and mixing the material, Wear protective mask, gloves and goggles during handling and mixing.